Preparing myself for an assault on my taste buds. 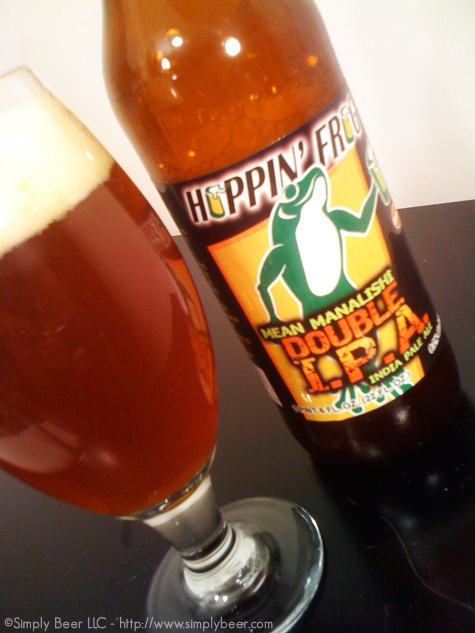 Tonight’s beer is the Hoppin’ Frog Mean Manalishi Double IPA, 8.2 % abv and a whopping 168 IBU’s. That a boat load of hops! I’m anxious to see if the Manalishi is able to hold up to that landslide of hops. This Ohio brewery doesn’t list the hops that are used on the bottle, but their web site does mention Columbus and Summit hops. This IPA is a hazy copper color beer, indicative of bottle conditioning with a fairly clingy head. While the foam in the center dissipates quickly there is a good hold on the glass by the foam on the out side creating a donut effect with the head. A DIPA should have a big aroma, nice piney orange on top, with underlying caramel toasty aroma under the dominant hop nose. It’s not a knock you socks off which you may expect from a 168 ibu beer, but is a very clean and refreshing aroma. I’m enjoying this beer, it has a big buttery creamy flavor right up front, which moves into a toasted malty orange flavor. It is a unique flavor combination for me. I’ve had toasty and orange in the same beer, but never one that I wanted to go out and deep fry a creamcicle covered in cereal. It is really a nice flavor. As that flavor subsides like the first wave of a tsunami, your mouth is rolled over and over again with this bitterness that sticks and doesn’t go away, it just keeps coming and coming, but doesn’t become overwhelming. I’m a fan! Oh and your burps taste like hops, that’s pretty cool! If you haven’t had this beer, go out and try it. If you have, what did you think of it. The heavy malt and heavy hops work really well together. I really enjoyed this beer, want another! I just don’t get beer distribution…this brewery is an hour from my house yet this beer is not on the shelves of the beer stores in town. Nice review. It sounds good…that description of buttery moving into malty orange. Unique is what I l look for in the realm of IPA. I’m going to see if they can order some for me. Aren’t you in Ohio??? It won a bunch of awards which may be why it is hard to find in Ohio. If you see it try it. I really enjoyed it. Yes, I’m in Toledo, OH. But hopefully for not too long. I’m going to hit up a shop I rarely go to that sometimes has a different selection. I really want to try this! You had me at orange creamsicle deep-fried in cereal! I’m in NJ, too, so I should be able to get my hands on this. Sounds like it’s a mouthful! @jim, last I checked the Liquor Outlet in Boonton had a couple bottles. on a side note they have a vast selection of whiskeys, bourbons, and scotches. enough to make me drool! The Liquor Outlet is my new go-to store. It’s on the way home from work which is convenient, but what’s really great is their selection. Lots of choices and really well “curated” if you can use that word for a selection of beers. I wound up in the hands of Kevin last time I was over there and he turned me on to a lot of new stuff, including Allagash. I think he was pumped up by your interview! I’ll look for this next time I’m over there, which might be today. Fridays are too busy there! I enjoyed this beer tonight and it’s a really good experience. Great thick malty mouthfeel with rich caramel and combined with strong hop bitterness is a lot of fun. The hop bitterness last and lasts, as you pointed out. I thought the hop flavour was more grapefruit and lemon than orange, but it’s all citrusy hops and lots of it. Thanks for your helpful review and for the calorie estimate!